Google Docs now lets you move a file to a folder without using the Docs list. Just click the "folder" icon next to the title of the file and you can pick one or more folders. This works for documents, spreadsheets, presentations, drawings, PDF files and any other files. Google uses the word "collection" instead of "folder" and that's confusing for both Google Docs users and Google's engineers. When you mouse over the new icon, the tooltip reads "folders". 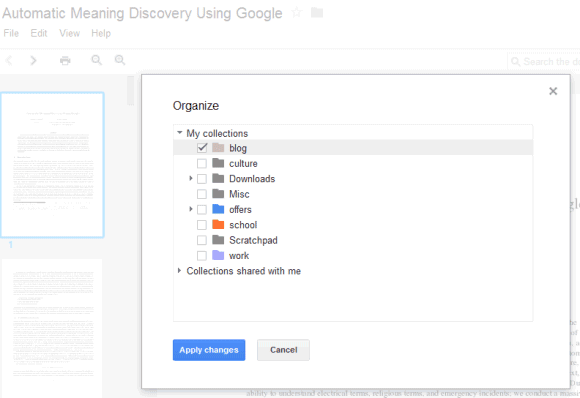 Google Docs collections are actually hierarchical labels because you can place a file in multiple collections. I do wish there was an option to set a default to "do not show in Home"
Long awaited feature. Thanks. I probably wouldn't have noticed it for weeks. Google docs is the best possible sharing tools available in the market. But their are some sharing issues with Google docs like while sharing a portion of a Google spreadsheet with my team members. There is no way I can do it without copying the data and pasting it on a new sheet. This increases redundancy. There should be an option where I can just share a part of my spreadsheet. Mean time I was always hunting for alternatives and found CollateBox http://www.collatebox.com/ . Seems like a descent tool for online sharing and collaboration. You can actually share one tab of a multiple tab spreadsheet. Don't know if that's what you need but I'm just saying. You can use ImportRange to import just one tab to another spreadsheet. Data will be linked to your original spreadsheet and changes and uptades will be shared. Essentially if I have to share Column1 data with TheRitz and Column2 data with Clis then I using Google docs I create two separate sheets, It gets annoying when I have to share data with 30 team members. N that's where I found about CollateBox luckily got an beta invite for the tool n its working wonders for me now..
"Google Docs collections are actually hierarchical labels because you can place a file in multiple collections". It's true you *can* use collections hierarchically, but you don't have to. That's the beauty of this sharing model. You can put a file in any collection that makes sense to you, hierarchical or not. This is probably reading *way* too much into it, but this simpler way of organising files could be step one in releasing Drive. I know it's clutching at straws, but right now I'll take any rumour/hint I can get. "I do wish there was an option to set a default to "do not show in Home" "
That is exactly what I've been waiting for. Once they add this simple change I will be content with how it's all organized. Actually, I don't think this is a mistake. I suspect that some engineers in Google Docs decided it was time for Google to introduce yet another way of doing things for their users. It's good to show the full path when clicking on the grey folder icon. Now it shows only the folder(s) it's in. It was quite annoying when you had five documents with the same name ("schedule" for different subjects, for example) and they were all identical in the search box. And the only way of knowing which was which was, well, clicking on all of them and reading what collection they belonged to in the general list. One of the best things about this feature is that you can assign new documents to a folder directly from the document itself without having to open the main documents window. A very welcome improvement.